Need 1 basket for all of your tumble and flat basket needs? 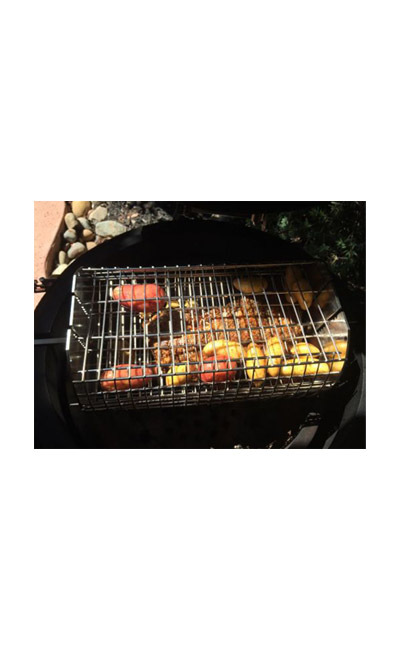 The OneGrill Performer Series Universal Fit Rotisserie Spit Basket has been thoughtfully crafted to address all of your rotisserie basket needs and truly add versatility to the rotisserie experience without the need for separate rotisserie attachments. 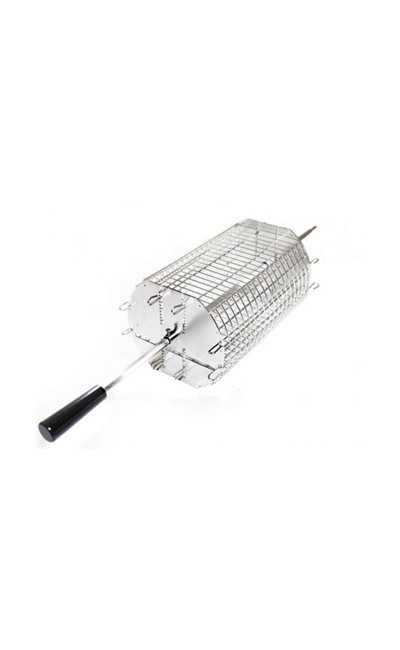 The perfect add on to your existing spit or rotisserie system purchase,this basket simply slides onto the spit rod and can be tightened down in the desired location on your grill. When used as a flat rotisserie basket, the opportunity for perfect adjustment and balance is always available. Featuring 20 integral individual flat rack height adjustments your options for cooking the thickest to the thinnest of meats, vegetables, and beyond will be a breeze while providing the perfect environment for even balancing. With the included 2 flat racks you will be able to position your load and vary the spacing of the racks based on your specific cooking needs. This basket will also come complete with 2 curved side racks to create a fully functioning, high capacity tumble style basket. Designed to clamp onto the curved sides of the basket, these curved racks provide limited grate spacing for small food sizes. All components are entirely 304 stainless steel construction. IMPORTANT MEASUREMENTS TO CONSIDER: Maximum outside width with racks installed is 16.25". Maximum outside diameter with racks installed is 9". Inside width is 13.25". Inside depth is 8". Please note that this basket will fit in rectangular or square grills with a minimum width of 16.5". 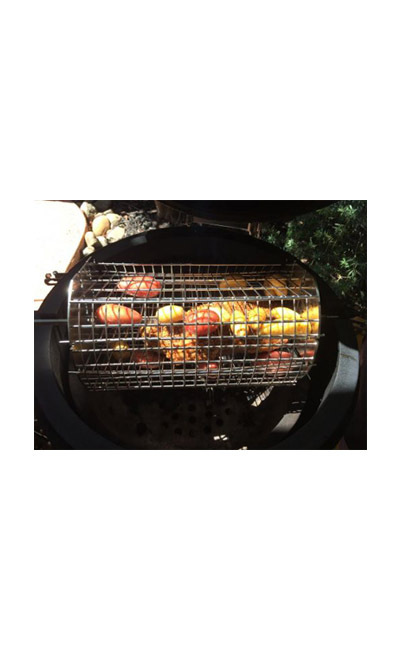 For round or "kettle" style grills a minimum diameter of 19" is required for fitment. 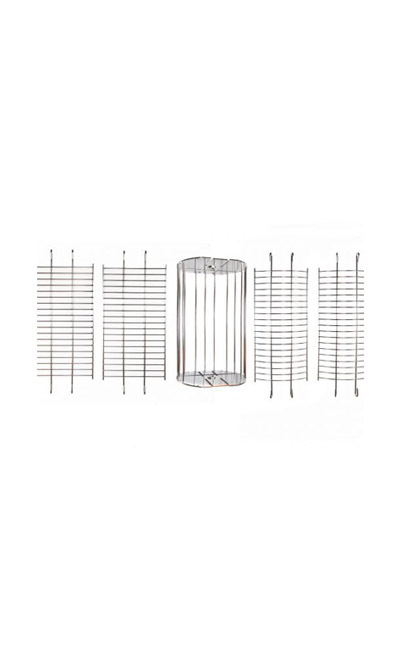 The necessary clearance form the grill grates, burners, or other obstacles to the spit rod needs to be 4.75" or greater to accommodate baskets outside diameter. On many grills removal of the grill grates during use will be necessary. 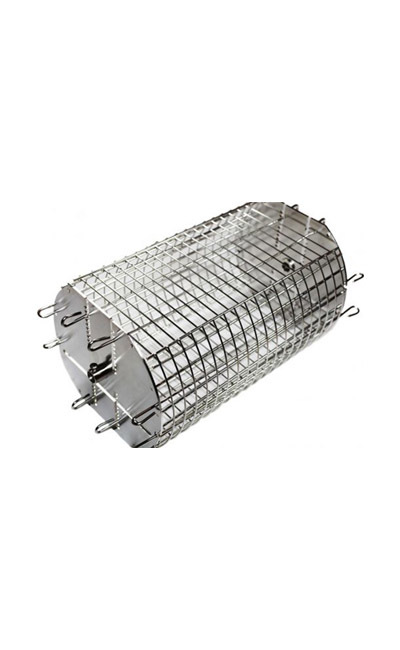 This basket will accept both 1/2" hexagon and 3/8" square rotisserie spit rods and allows them to pass through the basket. ADJUSTMENTS & USE: This basket will work as a flat, tumble, or combination basket. The included flat racks and curved racks are tool-less by design and can be adjusted by simply squeezing the tabs of the outside of the basket. For tumble operation the flat and curved racks should be employed together. The flat racks will occupy the middle portion of the basket and the curved will enclose the side grating. For flat basket operation you will simply compress the food between the 2 flat racks or make use of the curved racks for larger, odd shaped foods. With 20 different height adjustments and a top and bottom portion of the basket, the variations of spacing are numerous and will vary by food type and desired balance. Universal Fitment allows for fitment to popular 1/2" Hexagon & 3/8" or 5/16" Square rotisserie spit rods. Durable 304 stainless steel construction ensures rustproof performance. Easily slides onto existing spit rods for a universal application. Phillips Head screw tightening allows for positive lock and easy adjustment along the spit rod. Includes 2 flat racks and 2 curved racks for operation as a flat and tumble basket.